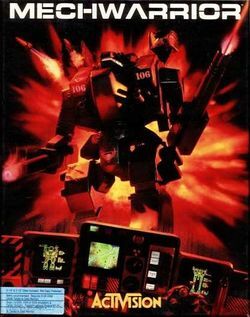 This is the first game in the MechWarrior series. For other games in the series see the MechWarrior category. For the SNES game, see MechWarrior (SNES). MechWarrior is the first in the popular MechWarrior series of games set in the BattleTech universe. The storyline focuses on the player, a member of the Burning Aces, who seeks to avenge his father and restore his family's honor with a time limit of five game years. The game was initially released in 1989 for DOS; in 1992 it was ported to the Japan-only Sharp X68000 as BattleTech. The game uses a mix of strategy, simulation and adventure mechanics; players are free to travel between dozens planets, recruit lancemates to fight alongside them, ally themselves with any faction they choose, and take randomly-generated missions. They can also engage in trading, buying cheap mechs on one planet and selling them for profit on another, and enemy mechs can be scrapped for cash. Following the storyline missions is necessary in order to complete the game, but none of the missions are forced upon the player. Later games in the series (with the exception of MechWarrior 2: Mercenaries and MechWarrior 4: Mercenaries) abandoned the trading and adventure mechanics and instead focused on cockpit action. This page was last edited on 16 August 2016, at 18:14.